Two men have admitted plotting to cause explosions in London and Birmingham as part of a Real IRA bombing campaign, while three others deny similar charges. James McCormack, 34, and John Hannan, 19, took part in a conspiracy to plant three car bombs in the UK in 2001, a jury at the Old Bailey was told on Wednesday. Their guilty pleas at an earlier hearing were announced as three suspected members of the Real IRA, went on trial accused of plotting the bombs at BBC's Television Centre in west London, another in nearby Ealing and a third in Birmingham. 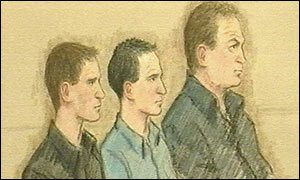 Robert Hulme, 23, his brother Aiden, 26, and Noel Maguire, 34, all deny conspiracy to cause a series of explosions. Mr Maguire and Robert Hulme also deny charges of unlawful possession of explosives and having a firearm with the intent to endanger life on 14 November 2001. Prosecutor Orlando Pownall QC said that in the BBC bomb on 4 March 2001 and the Ealing bomb the following August property had been damaged. "You may feel having heard the evidence that it was nothing short of a miracle that no pedestrians or people in houses nearby [suffered] fatal injuries," he said. In Birmingham that November it was fortunate a bomb had failed to detonate as it had been placed in the boot of a vehicle parked near pubs and clubs on a Saturday evening, said Mr Pownall. All the bombs used home-made explosives had similar timing devices and the same code word was used. While there was no proof the men had planted the bombs there was evidence they had helped plan the operations, the court heard. There was evidence Robert Hulme and Mr Maguire were in possession of a hand grenade, a Smith and Wesson revolver and live and spent ammunition found in a car parked outside a Yorkshire farmhouse, Mr Pownall said. They were also allegedly in possession of a home-made timing device similar to the one used in the Birmingham bomb. Mr Pownall alleged Mr Maguire's fingerprints had been found on money used to buy a taxi cab in Edmonton, in north London, later used for the BBC bomb. The jury was shown CCTV footage showing the cab en route to White City on the day of the bombing. And they were told mobiles and the location of these phones "at critical times" would play an important part in proving the three men were part of a team responsible for the bombing campaign. They heard about calls made between two mobiles after the cab was bought and up until half an hour before the car was planted outside the BBC. It is alleged Mr Maguire and Aiden Hulme made those calls. Mr Pownall said: "Cell-site evidence can determine which area a phone was in at a particular time but not in whose hands it was held." The trial, expected to last more than two months, was adjourned until Thursday. Neither Mr McCormack nor Mr Hannan, who will be sentenced at a later date, were in court on Wednesday. "The trial is expected to last more than two months"